COB Industries manufactures and distributes mechanical expansion pipe plugs and test plugs for just about any application so let us help you determine the right pipe plug for your application. All we basically need to know the answers to a few questions in order to determine what type of pipe plug would be the best option…what size?, what does the plug need to hold back, how much backpressure?, and how long is the plug going to be in place? Other issues (chemicals / temperature, etc.) may have to be considered as well. 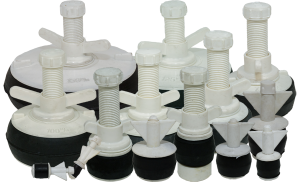 These superior, versatile, expandable pipe plugs are used to accommodate a wide variety of industrial applications where an airtight seal is required. These superior, versatile, mechanical cast aluminum pipe plugs are used to accommodate a wide variety of industrial applications where an airtight seal is required. 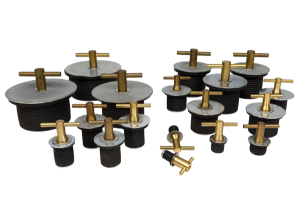 Low pressure pipe plugs available in a variety of styles including Turn-Tite, Snap-Tite, Hex- Nut and Thumb-Nut Plugs. 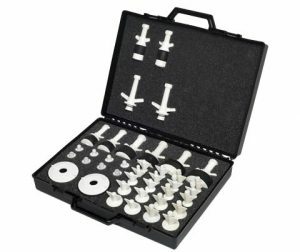 Kit includes mechanical nylon pipe plugs from 1/2” through 4” sizes (includes fittings and caps) in a hard carrying case with custom foam inserts.